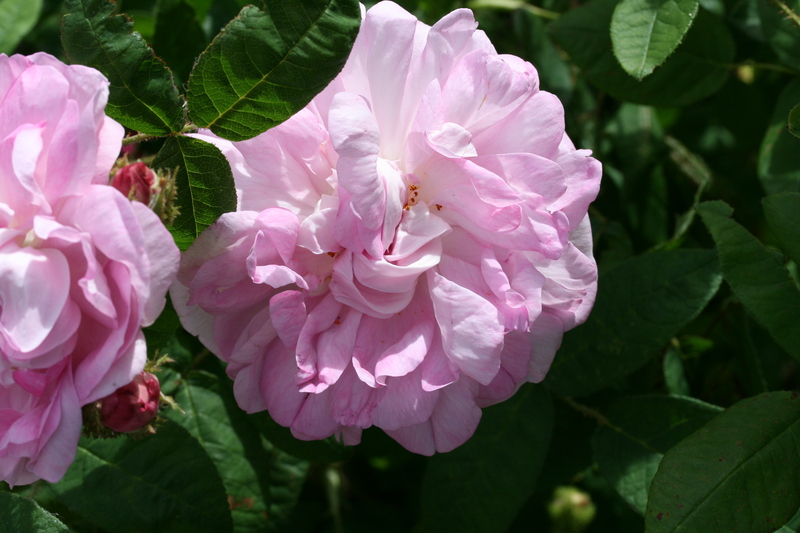 Father and son Louis Lévêque made sure that their names should not be forgotten; of the 147 now known roses that they bred, three different roses where named ‘Mme Louis Lévêque’: a Hybrid perpetual in 1864, a yellow blend Tea in 1892 and this moss rose in 1898. The moss rose ‘Mme Louis Lévêque’ is a somewhat stiff and upright shrub, with long-pointed bright green leaves; the bright pink buds are little mossed and on opening show very large full flowers of a soft pink, sometimes fading to an even lighter pink with a pleasant strong fragrance. The soft abundant flower petals sadly have a tendency to ball in wet weather, which can make this rose a bit unattractive to see, but in dry sunny weather the delicate flowers are truly spectacular. It is a remontant moss rose, but there is only a slight repeat flower later in the season.